Western Trails Food features Montana-grown Hulless Barley and locally-grown beans. We package them into healthy delicious foods—soup mixes, bread mixes, pancake mixes and more—that not only are mighty tasty, but can help keep you healthy. Hulless barley is proven to help lower cholesterol. It's high in fiber to keep you regular, high in protein, and may work for those who can't tolerate gluten. 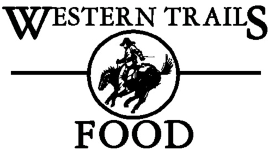 Western Trails Food is made and packaged by the Farm-to-Table project in historic Glendive, Montana, a nonprofit group of volunteers who believe in and are pursuing a local sustainable food system. In October 2006 we purchased Bud & Jean Clem's Western Trails Cowboy Food business that they had developed and perfected over the past 20 years in Bozeman. It's a perfect fit for the agricultural products grown in eastern Montana. Western Trails blossomed from the Clem's chuckwagon catering business and their finger-licking-good Rustler Bean Sauce to many soup and barley recipes. We are pleased to carry on their tradition of quality products and healthy recipes from the west. Our goal is to use locally-grown or Montana-grown products and promote sustainable agriculture practices. We now feature beans grown locally; you can tell the fresh difference! Barley is the new rice! Hulless barley comes to you straight from the field with no loss of nutrients in processing. Naturally high in protein and fiber, with a low glycemic index, hulless barley is high in beta glucan that can lower cholesterol. To Cook: Cover with water and boil 5 minutes. Let stand one hour and use in recipes. Great as stuffing, as a rice substitute, in soups, salads and whole grain cereal. It freezes well for later use. Works great in a rice cooker; use a 3/1 ratio liquid to whole grain hulless barley. Try it with a package of dry onion soup mix! For more ideas, visit our recipes page. Now our beans are local! After trying to find a source for pink beans in our six bean soup, and finding them only available by the semi-load, we decided to grow locally. The harvest was successful. Red, pink, black, great northern (white) and pinto beans are now grown by a local farmer along the Yellowstone River outside of Glendive. Eastern Montana has a great climate for beans. We clean them both by machine and by hand, before packaging them in clear bags so you can see the quality difference. They are available in one, five and ten-pound bags in our online store and in retail outlets throughout Montana. 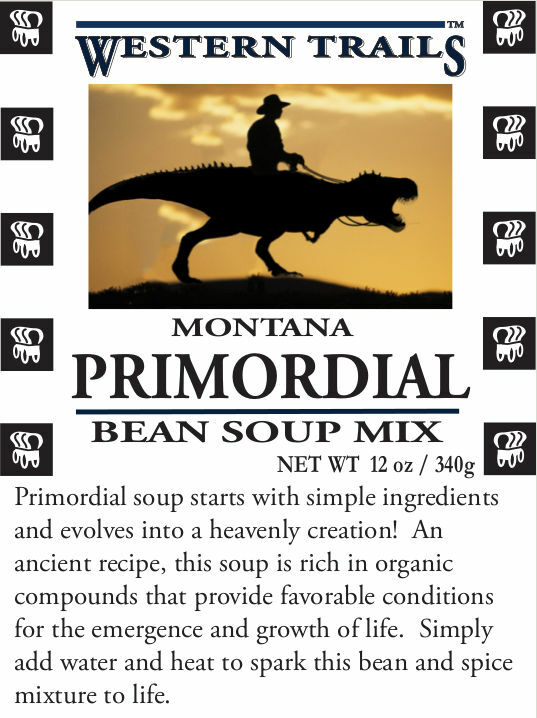 We've added a new soup in collaboration with Kathy Wankel, a nurse educator from Angela, MT who discovered the most complete T-Rex ever found, in 1988. The Wankel T-Rex has been at the Museum of the Rockies in Bozeman, MT but is going to the Smithsonian to show off to the world for 50 years. Kathy Wankel wanted soup mixes as a gift for family and friends at the dedication in Washington D.C. The dedication day turned out to be during the government shutdown in October so will be rescheduled, but the soup mix has been discovered. Read more about it here! Welcome NuWorld Nutrition customers! We hope to serve you as well as Wally has. Our comparable product to NuWorld's Hot Barley cereal is our Quick Hulless Barley Boost'R Flakes or Quick Barley Flakes. We also have the Steel Cut for those that like the slow cooking old fashioned flakes. The nutrition value is identical and we are now offering it in 3# size. Up to 12 pounds will fit in a priority mail box. Hulless barley comes to you straight from the field with no loss of nutrients in processing. Naturally high in protein and fiber, with a low glycemic index, hulless barley is high in beta glucan that can lower cholesterol. We've got more nutritional information and great recipes. Baskets or boxes an be customized, or we can put together a selection or our best-selling flapjack mixes or cowboy label goodies. 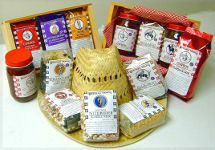 Add $2 for gift basket and red/white cloth napkin and a Made in Montana gift tag you can personalize. We also have a white gift bag with Made in Montana sticker. Call us (406-377-4284) for gift package suggestions. Please visit our online store to order. We accept Paypal for online orders. We also accept credit card & check orders by phone; call us at 406-377-4284. To see where you can buy our products in your neighborhood check the retail outlets page. We ship via USPS Priority Mail, starting at $6.80—a great buy for our barley and bean products. Wherever possible we network and can arrange rides for large orders, especially along I-90. Those who deliver products for us receive a tax-deductible receipt for the volunteer delivery, as we are under the umbrella of Community GATE, a 501(c)(3). Contact us if you would like to carry our products at your store or institution. For orders over $200, you can receive a covered wagon canopy display unit. We make custom labels (200 or less) for special events or labels for your home-grown or value-added food projects, like salsa or wine. Contact us for more information. Web design by Peggy Iba.